US Ambassador writes condolence letter to family of Rabbi Itamar Ben-Gal, murdered in terror attack, who leaves behind wife and 4 children. 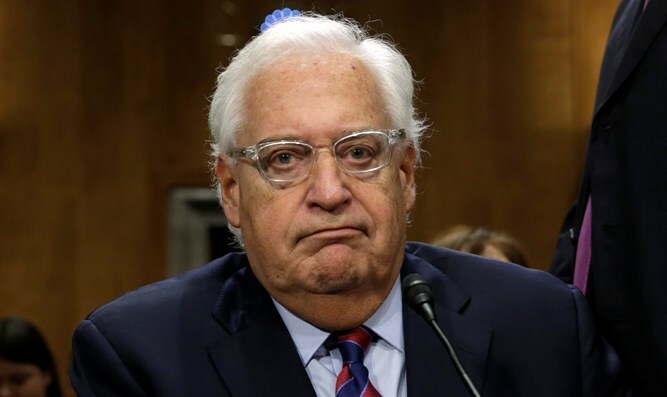 US Ambassador to Israel David Friedman wrote a condolence letter to the family of Rabbi Itamar Ben-Gal, who was murdered last week in a terror attack in the Samaria city of Ariel. The letter, dated February 8, was conveyed to the family by Yesha Council chairman Hananel Dorani, who came to the family home in the Samaria community of Har Bracha this morning, Sunday, for a condolence visit. “Perhaps the most difficult task I have as the US Ambassador to Israel is that of consoling victims of terror. Once again, my heart breaks as I reach out to a beautiful family that has lost a husband and a father,” Friedman wrote. “There is no greater contribution in life than the providing for the education and development of the next generation. By devoting his life to teaching at Yeshiva Bnei Akiva in Givat Shmuel as well as in your hometown of Har Bracha, Rabbi Ben-Gal pursued this mission not as a job, but as a higher calling. Upon hearing your words at the funeral about the life of your husband, it became clear to me that you, too, have an inner strength and courage cultivated by a life of care and concern for others. “Just as Rabbi Ben-Gal dedicated himself to nurturing others, during this terrible time the Government and people of the United States of America are standing with you, your precious family and community. "May his memory be a blessing," he wrote in Hebrew. Friedman concluded with the traditional Hebrew words said when comforting mourners.